• Directly between 2 of the best powder sand beaches on Maui. They both have soft, clean sand and crystal clear water. • Awarded a listing in LUXURY RENTALS, HomeAway's exclusive luxury collection. This fully remodeled stylish yet comfy home is truly one of best condos in all of South Maui. Experience epic sunsets, turtles & whales right from your private patio. Green Sea Turtles hang out year round, and Humpback Whales visit Nov-Apr. You are steps to the beach - NO STREETS TO CROSS! • Keyless entry keypad allows 24-hour self-check-in any time after 3 PM. • Digital Guest Welcome Book (Touch Stay) contains information, tips, island guide, and owner's recommendations. Professional concierge service is available. • Items Included: Beach + Pool towels, 2 low folding beach chairs, 2 tall folding beach chairs, large beach umbrella, cooler, boogie board, pool noodles, kids toys and more. This property is owner managed by me, Stacey. No management booking fees or other surprise fees! Owner and on-island contact provide 24-hour guest support via telephone, text, and e-mail. I love making personalized recommendations for my guests, so don’t be afraid to ask. 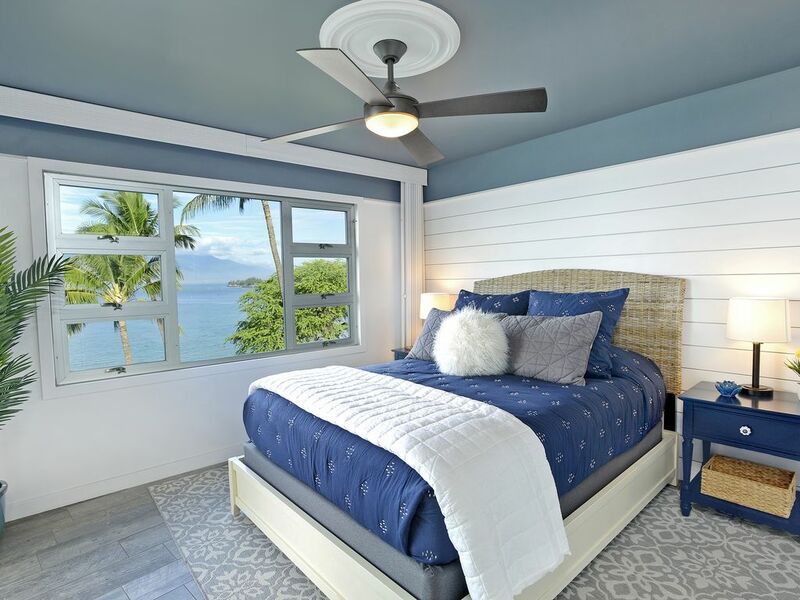 Maui Beachside 1 is the perfect beachfront vacation home for couples, honeymooners, babymooners, friendmooners, weddingmooners, anniversaries, family vacations, solo explorers or just to get away to tropical paradise. We'd love to hear from you and help you plan your upcoming vacation. What brings you to Maui? Maui Sunset is located in central Kihei on Waipuilani Beach Park. Stunning penthouse ocean and pool views, magical Maui sunsets & whales. TripAdvisor has named Maui the #1 island in the World. We have traveled throughout the Hawaiian islands, but this section of Maui was always our favorite. We love the sun, powder sand beaches, warm swimmable ocean water, turtles, whales, magical sunsets, kiteboarding, SUP (stand up paddleboarding), scuba diving, yoga, golf, hiking, and delicious food. We decided to purchase a condo in Kihei so that we could spend more time in Maui and also to share our love for the area with our family, friends, and guest. When we walked outside onto Maui Beachside 1's lanai (Hawaiian for veranda, patio or porch) for the first time and saw multiple Green Sea Turtles floating around we knew this was the one. Its location is perfect to stay put or jump around exploring the Valley Isle. Designer bathroom features 2 shower heads (one detachable), heated towel warmer, magnification mirror, hair dryer, and lots of counter space. Bath linens include bath towels, hand towels, wash towels and pool/beach towels. Shampoo, conditioner, & body wash.
Sandy swimmable beaches (Kamaole Beach 1 and 2) are less than 1 min walk from the home. Mount Haleakala (10,023') is visible from the front door or from the rooftop garden. Direct Pacific ocean views, West Maui, and magical Maui sunsets. There is a powerful dual zone air conditioner in the living room and bedroom. Bedding, sheets, and pillows are provided. Full size and in the home. Laundry detergent is provided. Full size and in the home. Dryer balls are provided. Free parking is included in the Royal Mauian parking lot. Bathroom (bath, hand and wash towels), kitchen and beach / pool towels are provided. Blazing fast 100 MB high-speed WIFI internet. Provider: Spectrum. Note: No landline telephone in the home. Cell phone coverage is available over most of Maui. Pay phone across the street. Ocean views from a comfy sofa and chair with ottoman. Quite dishwasher. Detergent is provided. The refrigerator/freezer dispenses filtered water and ice cubes. An InSinkErator filtered hot and cold water dispenser faucet is located at the kitchen sink. Keurig and French Press. Coffee bean grinder and milk frother. There is an immersion hand blender, rice cooker, and waffle maker. Spice rack and condiments provided. Pantry with extra open shelving to store food so that you can use the countertop! Dishes, utensils, Wusthof knives, cookware, and glass food storage containers provided. Kids dishes & utensils included. Outdoor dining table with 4 chairs. The kitchen peninsula has 3 counter stool. Children's booster seat. Additional dining on the Rooftop Garden with BBQ grills, seating, and 360-degree views. Living Room: 65” flat screen HDTV with all sorts of evening entertainment. Cable TV, Netflix, DVD player, Xbox One S, Apple TV, and a Sound Bar. Bedroom TV: 32" flat screen. Center channel speaker sound bar (Vizio). There are a few books on Hawaii in the home. The library is on the 2nd floor and can be accessed with the common area code. There are cards, Jenga, tic-tac-toe, cribbage, and more. There are various children's toys and books. Beach toys, pool noodles, and a boogie board. X-box with Halo 5 and other games. The property grounds are immaculately maintained with palm trees and Hawaiian flowers. Lounge chairs. Outdoor showers. There are 2 low beach chairs, 2 taller beach chairs, boogie board, pool noodles, large beach umbrella, food/beverage coolers, and other beach toys. Close to world class golf courses in Wailea. Access to the outdoor roof-top garden requires a small flight of stairs, and may not be easily accessible to those with limited mobility. A pool chair lift is available. Outdoor heated freshwater pool with ocean view. Lounge chairs and tables w/chairs. The pool area is gated and secured with a key code. There is a pool chair lift for guests needing assistance. HOUSEKEEPING & OTHER SERVICES: • The home is professionally cleaned before arrival. • Daily housekeeping is not included, but additional service or special requests (fresh flowers, fruit, champagne, etc.) can be arranged for additional charge. • Private chef, in-home massage therapy, and a professional concierge can be arranged. BUILDING: The ROYAL MAUIAN resort consists of 107 individually owned condominium homes on a private 2.2 acres. The six-story, crescent moon shaped concrete building with spacing between the floors, makes each room virtually noise free. The concrete also eliminates most of the bugs that area common issue in tropical locations. There are environmentally friendly solar panels on the roof. The 1 BR units in Royal Mauian ‘09 stacks have a bedroom with ocean views. The units ending in '06 and below do not have sunset views. Royal Mauian #509 is located in the desirable middle section of the building making it perfect for watching sunsets, turtles, and whales. We booked this condo for our honeymoon and first trip to Maui and it was absolutely WONDERFUL! Stacey was so attentive from the minute we booked the unit with recommendations and helpful tips all the way through the day we left. We had everything we could have possibly needed in the condo to enjoy ourselves. Any time I thought I should have packed something or would need something for the day, it was already there waiting for us in the condo! The unit is incredibly decorated and has a breathtaking view of the ocean and sunset! The beach that is steps from the building, and restaurants/groceries/coffee shops are a few steps across the street. Kihei is a fantastic spot and central to everywhere we wanted to go on the island. I wish I could give more than a 5-Star rating! We will definitely be back. Mahalo! We were thrilled with every single aspect of our stay here. The condo has the most amazing view, beach access and all the amenities you could need for a perfect vacation. We just love coming back to Royal Mauian 509! We know Stacey will always be a very attentive owner, the unit will be maintained with great care and we will have everything we could possibly need to make our stay feel like home. And as always, the breathtaking ocean view greeted us. Little touches like a written note for my husband and I or a favorite item (for us, local coffee beans) made us feel so welcome. This location continues to be our absolute favorite. The beach that is steps from the building is the best spot in Kihei and in or opinion, on the whole island. It's peaceful, great for turtle and whale watching and calm enough of a surf to enjoy bobbing in the waves or snorkeling. We love having Hawaiian Moons natural grocery/juice bar right across the street and being able to walk or run fully sidewalked streets out the front door and for miles in both directions. As always, I can't say enough good things about the unit and the service that comes with it. Mahalo!!! We booked our family trip as a celebration for my wife’s birthday and this did not disappoint. The property was beautifully decorated and had more than everything we needed inside. Location was ideal for the spectacular ocean view, easy beach access and proximity to shopping and restaurants. We felt treated as family and exceedingly well cared for by the owners. This was first class all the way and we will not hesitate to book again! I'm very happy to provide this five star review of Unit 509 in Kihei's Royal Mauian. From the very well stocked kitchen to the incredible views, we couldn't have asked for a better holiday home. Throughout the unit, the attention to detail is exceptional and this lovely home provided us with a rain or shine envoironment that we thoroughly enjoyed. The Royal Mauian has the best location in Kihei between two beaches. From your lanai you can see beautiful sunsets and whales and turtles swimming . Walk across the street to get freshly baked cinnamon rolls and delicious fish dishes at Coconuts and Cafe Olei. Condo #509 is outstanding. It’s one bedroom faces the beach so you can leave your window open and fall asleep listening to the surf. We spent the better part of our time at the condo out on the lanai. It is exactly like the the pictures on the VRBO site. The bed and furniture were extremely comfortable. The kitchen was fully stocked with every kitchen utensil, pot, storage container, and even spices. All the beach supplies you could need were there. Stacey also keeps you informed of any special events happening on Maui while you’re there. When we return to Maui we will definitely want to stay in 509. TripAdvisor has named Maui THE #1 ISLAND IN THE WORLD. Kihei was once a regular destination for sojourning Hawaiian Royalty. The ROYAL MAUIAN resort is perfectly located in South Kihei, where you find the sunnier & drier conditions along with the best beaches and restaurants that Maui has to offer. It is situated ideally between two of Maui’s best beaches, Kamaole Beach I and II. The walk is approximately 1-minute to get to either of the sandy & swimmable beaches. The grounds are beautifully maintained, with lounge chairs and a newly refinished and heated (approx. 83F/28C) freshwater swimming pool that overlooks the ocean. The walk to the pool is approximately 1-minute. Snorkel with turtles, tropical fish, eels, octopus and rays right out front in the ancient lava reef. Go for a swim at Charley Young Beach (North part of Kamaole Beach I), boogie board, or paddleboard up to Cove Park for the best beginner wave surfing on the island. Countless other activities are close by including the road to Hana, Mt. Haleakala, kite surfing, zip lining, scuba diving, golf and yoga (oceanfront right next door). Right across the street you will find excellent shopping, sports rentals and some of the best restaurants in all of Maui, including local favorite, Café O’Lei, Coconuts, Da Kitchen, Maui Tacos, Koiso Sushi, Shave Ice, Cinnamon Roll Fair/Place, and Hawaiian Moons Natural Foods (Grocery Store). The closest fitness center is 1 mile north. World-class golf, tennis, dining and more shopping are in Wailea, about 5 minutes away. NO BOOKINGS that leave gaps of 3 or 4 open nights between your booking and other reservations. Contact me with any questions before booking. Hawaii Tax ID #: General Excise Tax: GE-098-661-2736-01 Transient Accommodations: TA-098-661-2736-01 Travel Tip: Check flight options, confirm time off from work, and arrange pet watch before booking your accommodations.